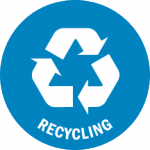 Universal Recycling requires listed recyclables to be diverted away from the landfill and to recycling efforts by July 1, 2015. 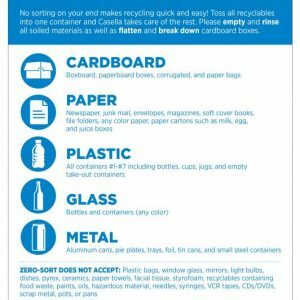 These listed recyclables included aluminum and steel cans, aluminum foil and pie pans, glass bottles and jars, plastic bottles and jugs (PET and HDPE), corrugated cardboard, white and mixed paper, newspaper, magazines, catalogues, paper mail, envelopes, box board, and paper bags. Universal Recycling also bans leaf and yard debris from landfill disposal in 2016, and food scraps by 2020. 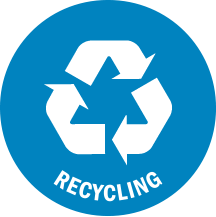 Each time you recycle your bottles, cans, paper, and plastics, you are helping to preserve natural resources, reduce greenhouse gas emissions, and decrease energy use. While our individual efforts might not seem like much, our actions together have a considerable impact on our environment and economy. Recycling also creates Vermont jobs and adds value to discarded materials. 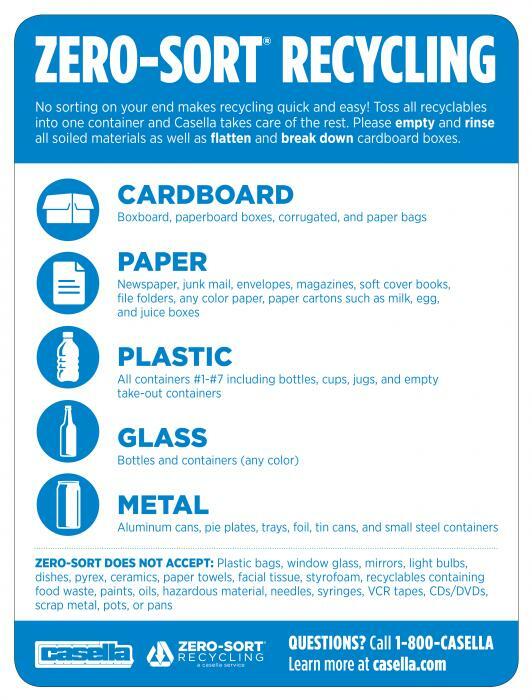 Click here to learn more about Casella’s Zero Sort® Recycling, including acceptable materials and materials that are not accepted in the Zero Sort program.